Climate change is kicking in faster that expected, and the global threshold of 2oC is now considered the line between dangerous and extremely dangerous climate change. What will it take to avoid this highway to hell? WHAT: Some carbon budgetary truths for the world – how much do we have left to burn and when do we have to stop it by? Have you ever seen one of those reality TV shows where a person who is hopeless with money is given some budgeting ‘real talk’ and taught to live within their means? This paper is going to do that for your carbon budgets. Humans love to procrastinate – we’re great at it. And despite all the new semester resolutions of keeping on top of the work this time, it inevitably leads to last minute late night exam cramming. However, it looks like climate change doesn’t have this problem. Currently, the arctic ‘death spiral’ is decades ahead of melting from climate change schedule, the Great Barrier Reef in Australia is already 50% bleached and dead and the drought predictions for the south west of the USA are also ahead of schedule. This means that the globally declared point that we shall not pass for global warming of 2oC has now been upgraded from the line between acceptable and dangerous climate change to the border between dangerous and extremely dangerous climate change. Congratulations on the promotion 2oC? So now that procrastinating past 2oC is looking like a dangerous decision, what do we need to do about it? These researchers looked at the Copenhagen Accord from the 2009 UNFCCC negotiations (remember the non-binding one?) and it states that we must act to prevent going above 2oC of global warming on the basis of science and equity. Since it’s the cumulative emissions that are really going to bite us, the researchers decided to work from the end point of preventing 2oC in different scenarios and then worked the carbon budgets backwards to see if we have a chance of meeting the 2oC goal and how we could do it. The UN separates the UNFCCC agreement into two groups: Annex 1 countries (which is the developed world) and non-Annex 1 countries (the developing world). 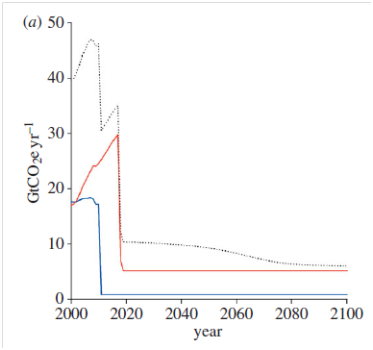 Keeping with the ideal of equity, the scenarios in this paper allow for emissions to grow in the developing world longer than they can grow in the first world. However, the paper did point out that if developing nations grow into developed fossil fuel economies, their emissions will outstrip world emissions from the industrial revolution to the 1950s, so mitigation in the developing world is going to be increasingly important really fast. The paper does three scenarios and then tweaks each one. The first scenario only counts CO2 emissions which allows it to be more accurate, but doesn’t include other greenhouse gases. The second scenario includes all six main greenhouse gases which makes it less accurate (more variables) but also more realistic. The third scenario looks at what is currently considered ‘politically possible’ in terms of emissions reductions. It gets long, so I’ll provide a handy summary table too! Interestingly, the Bill McKibben budget of 565 Gigatonnes (Gt) of carbon (2055 Gt of CO2) from his Rolling Stone article is not considered here, because the chance of blowing past the 2oC limit is too high. If we have a carbon budget of 1321 Gt CO2 and emissions from the developing world grow at less than 3% per year until 2015, and reduces by 6% per year after 2020, and the first world reduces their emissions from now by 11% per year, we have a 36% of still causing extremely dangerous climate change. If we do the above but the developing world’s emissions grow until 2025, they’ve spent the whole carbon budget at once and we blow past 2oC. But if the developing world’s emissions grow at less than 1% until 2025 and they reduce their emissions by 7-8% per year while the first world reduces by 11% per year from now, then there’s a 37% chance of causing extremely dangerous climate change. The researchers described this one as ‘plausible but highly unlikely’. So what happens if we’re a bit more realistic and increase the burnable budget a bit? If we have a carbon budget of 1578 Gt CO2 and emissions from the developing world grow by 4% per year until 2015, first world emissions don’t grow and global emissions reduce by 5-6% per year from 2015, we have a 50% chance of causing extremely dangerous climate change. If there is a 5 year delay and emissions in the developing world grow by 4% per year until 2020, and then reduce by 7-8% per year after that while the first world reduces by 7-8% per year from 2010 (yes, from two years ago), then the 5 year delay bumps us up to a 52% chance of causing extremely dangerous climate change, even with the faster reductions. Given we needed to start two years ago, that one’s out too. If the developing world misses the 7-8% per year reduction targets above and only reduce emissions by 4-5% per year, they spend all the carbon budget and we either blow past 2oC or first world emissions fall immediately to zero in 2015. Also not workable then. If we include all the other greenhouse gases like methane and nitrous oxide (which means we start talking CO2 equivalent because otherwise it’s really unwieldy to count), we can also count emissions for food production for the 9 billion people we’re going to have on the planet by 2050, which will be around 6 Gt Co2e per year (animals fart methane and crops need nitrogen among other things) and further reduces the carbon budget. If the budget is 1376 Gt CO2e and the developing world’s emissions grow at less than 3% per year until 2015, emissions in the first world need to drop to zero in 2015. So that budget is bust too. If the budget is 2202 Gt CO2e and the developing world increases emissions by less than 3% per year until 2015 and then decreases by 6% per year and the first world reduces emissions by 3% per year until 2020 and then 6% per year after that, we have a 39% chance of causing extremely dangerous climate change. If the developing world grows at 3% per year until 2020 and then reduces emissions by 6% per year, the first world needs to reduce emissions by 10% per year from 2010. So that budget is also bust. If the developing world only grows at 1% per year until 2025 and reduces by 4-5% per year, the first world’s emissions need to be flat to 2014 and reduce by 6% per year after that. If we could do that we would have a 38% chance of causing extremely dangerous climate change. But here’s the problem; currently what is considered politically and economically possible for reducing carbon emissions is reductions of 3% per year. Which blows all of these budgets. If we only counted the CO2,had a budget of 2741 GtCO2 (which is higher than any of the budgets above) and reduced our emissions by 3% per year from 2015 in the first world and 2030 in the developing world, we have an 88% chance of causing extremely dangerous climate change. Basically, what we’re currently doing is going to fail spectacularly in the near future. And since physics doesn’t negotiate we can’t get an extension on this one. If we are to make any of the carbon budgets above, society needs to be reducing carbon emissions at a much higher rate than we currently are. This paper is not intended as a message of futility, but rather a bare and perhaps brutal assessment of where our ‘rose-tinted’ and well intentioned (though ultimately ineffective) approach to climate change has brought us. Real hope and opportunity, if it is to arise at all, will do so from a raw and dispassionate assessment of the scale of the challenge faced by the global community. This paper is intended as a small contribution to such a vision and future of hope. This entry was posted in climate change, greenhouse gases, mass extinction and tagged act now, carbon budget, climate change, climate dice by amyhuva. Bookmark the permalink.